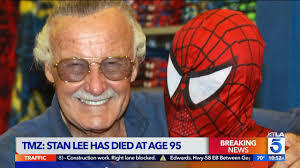 Marvel comic book creator Stan Lee has died at the age of 95. Stan Lee was born in 1922 and is one of the men responsible for creating a new era of storytelling; he lived long enough to see his comics be turned into very successful movies. Lee was known to make small cameos in almost all of the Marvel movies. He was rushed to the hospital from his home in Los Angeles and was later reported dead. The official cause of death is unknown, however, many believe it is due to natural causes.